Bass guitarists often play several notes of a chord simultaneously, but first, you must start with the triad. The triad is the basic chord form, consisting of the three most important notes of any scale: the root, 3rd, and 5th. This structure is called a triad because it has three notes. You can find the notes for the triad by playing any scale up to the 5th note, skipping every other note. In other words, you play the root, skip the 2nd note, play the 3rd, skip the 4th, and play the 5th. You can tell whether a scale is major or minor merely by listening to its triad. A major triad has a regular 3 (1, 3, 5) and produces a happy sound. A minor triad has a ♭ó3 (1, ♭ó3, 5) and produces a sad sound. Musicians sometimes refer to triads as chords. For example, a major triad may be referred to as a major chord. The major triad is the chord that’s related to the major scale. 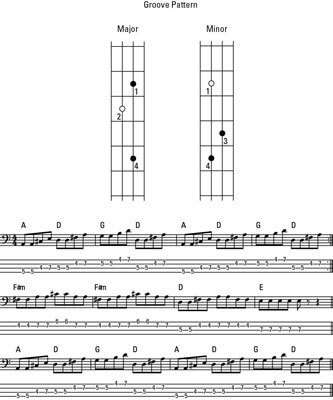 Just play the root, 3rd, and 5th notes of the major scale to get a major triad. You can easily play it with no shifts in your left hand. Make sure you start the major triad with your middle finger. The open circle represents the root, and the solid dots represent the other chord notes. You may include the octave root (as in this example) if you like the sound. It’s the same note (an octave higher) as the root and won’t change your triad one bit. Here are some examples of major triad accompaniments (bass lines you play to support soloists). The simple structure of the major triad gives you enough notes to choose from to play some hip accompaniments. You can hear the major triad and its subsequent accompaniments. The major triad is at 0:00; accompaniment a at 0:11; accompaniment b at 0:35; and accompaniment c at 1:00. You can also see these triads being played. Triads are a simple yet effective method to accompany a tune. The minor triad comes from the minor scale. You construct the minor triad by playing the root, 3rd, and 5th notes of the minor scale, which translates into the root, ♭ó3, and 5. 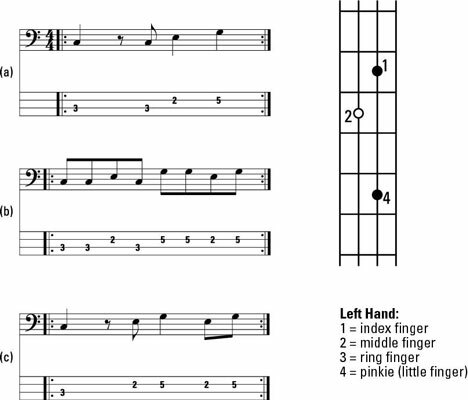 You can play any minor triad with no shifting of the left hand, and you start it with your index finger. Like the major triad, the minor triad gives you plenty of notes to choose from for some cool accompaniments over minor tonalities. You can play any of the notes in the grooves in any key (not just in C), without changing the shape of the grooves (the pattern of the notes in relation to each other). 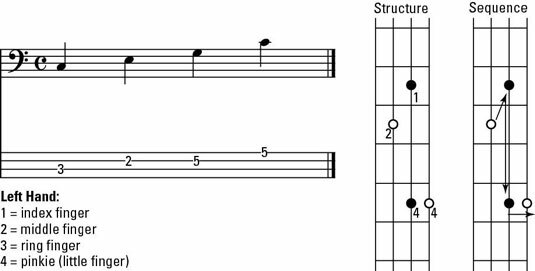 For example, try starting on a different note, such as D (using the D as the root of the triad), when you play the note patterns shown on the grids. You can hear the minor triad and accompaniments. The minor triad is at 0:00; accompaniment a at 0:10; accompaniment b at 0:34; and accompaniment c at 0:59. You may think the triad is a simple, unsophisticated device and certainly not the stuff of the big leagues. Well, think again. Just listen to Bruce Springsteen’s song “Jersey Girl” or The Drifters’ “Under The Boardwalk” or a number of other megahits, and you quickly realize that this seemingly unassuming device packs quite a punch. Here, you hear a song that has the bass laying down the triads as the perfect accompaniment. As you listen, follow along. 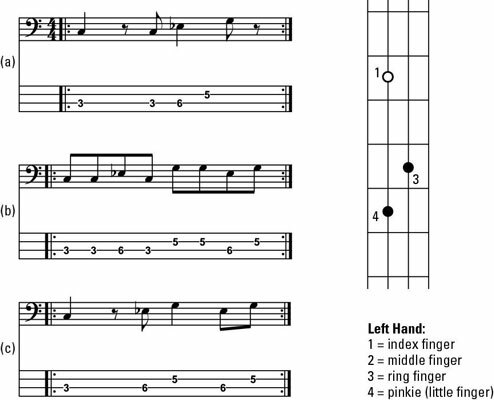 All you have to do is get your fretting hand in position to play a major triad (starting with the middle finger on the root) or a minor triad (starting with the index finger on the root). When you’re comfortable with this, play the triads along with the song. Eventually, when you’re familiar with the bass part, pan the music so you don’t hear the bass and play the part along with the track. After that, it’s only a matter of time before you can hang your own gold record on your wall.